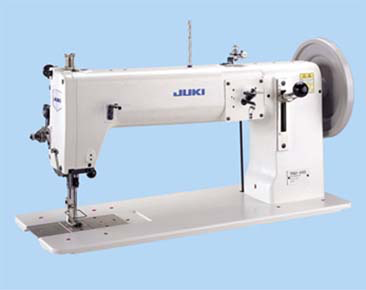 "Four different feeding methods are available "
TSH-411 (Bottom feed) - can be modified to sew sharp curves by replacing the presser foot with a roller presser. TSN-421 (Needle feed) - With its bottom feed and feed-dog feed, the machine sews articles entirely free from uneven material feed. TSU-471 (Top & bottom feed) - The top feed amount is adjustable within the range of ±30% of the bottom feed. TSC-441 (unison feed) - A top & bottom feed mechanism has been added to the machine's needle feed system. This ensures a higher feed efficiency and the production of higher-quality seams without uneven material feed. The lifting range of the presser foot is as high as 20 mm for smooth placement/removal of extra-heavy-weight materials. Frequency of bobbin thread replacement is reduced. The machine comes with a large shuttle-hook. 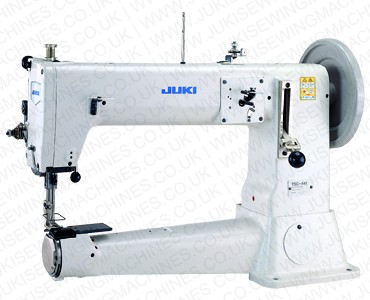 The bobbin winder is built into the front portion of the machine arm for easy manipulation.